I had been looking for the Physicians Formula Conceal RX for quite some time and could never find it. I was placing an order with Drugstore.com and searched for it on their site, found it and added it to my cart. It has some pretty good reviews online and I really wanted to try it. I have stubborn, dark under eye circles and also get the occasional blemish that I want to cover up. I’ve tried out several drugstore concealers and most end up being a fail. I purchased the Physicians Formula Conceal RX in the shade ‘Natural Light’. My main reason for purchasing the concealer was to cover up my under eye circles so I tried to chose a shade a few shades lighter than my skin tone. The concealer comes in a tube, which I both like and dis-like. I like tubes because they are easy to use and pretty sanitary as opposed to a pot or something with an applicator on the end. The only thing I don’t like about tube packaging for concealers is that some products separate and you really have to shake the tube, which is kind of hard to do. I haven’t noticed any separation of the Conceal RX as of yet and I’ve owned it for well over a month now. I enjoy the formula of the Physicians Formula Conceal RX. It is fairly thick and a little bit goes a long way, so be careful when applying it. It smooths out nicely and really does help conceal my dark under eye circles. At first, after application, I really liked the concealer and was really excited, it has great coverage. I thought that it was going to be a new holy grail product. I case you don’t know, I’m in my late 20’s and have developed some fine lines under my eyes. After an hour or two the Physicians Formula Conceal RX sunk into my fine lines and really made them show. I was quite disappointed when I looked in the mirror and noticed as I really liked the coverage the concealer gave. I tried applying less of the concealer around my eye area and it still sunk into my fine lines and made them more noticeable. I still try and use the Conceal RX, but I make sure not to apply it over my fine lines which are right under my eye. I can still conceal my dark circles as they are slightly below my fine lines. It takes some extra work, but I want to use up the product. If you do not have any fine lines or wrinkles than this concealer should work great for you. It would be a great under eye concealer for anyone with young skin. I don’t think that it would be the best concealer for dry skin types as it does sink into my fine lines, so I image it will stick to dry areas on the face as well. I will probably pick up this concealer in a shade darker if they offer it and use it conceal my blemishes as the shade I originally purchased is too light for that purpose. 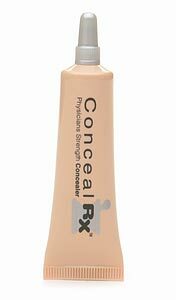 If you have young skin then I suggest trying Physicians Formula Conceal RX for your under eye area as it does have really good coverage.